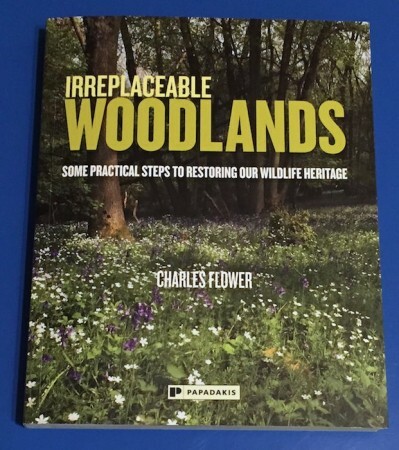 Charles Flower has been custodian of the 25-acre Mapleash Copse for thirty years, and in this book he records his knowledge and passion for British woodland and everything that lives within it. He has done an incredible job, as this truly is a masterwork and an absolute joy to read. It blew me away with its depth and breadth and sparkling photography. Brace yourselves – this is going to be a gushingly positive review. Like many people, I love a walk in the woods, at any time of year, and this book brings those British woods to life. It starts with an in-depth history of Mapleash Copse mixed in with the evolution of British woodland and its place as a critical resource over the millennia that people have lived in these isles. This history is detailed and fascinating, ramming home just how important woodland was, and how deliberately and intensively it was managed. Each type of wood had its particular use, from wheel hubs and spokes to tool handles and charcoal. Really it’s only in the last hundred years that this has ceased to be and most woods have been largely left to their own devices. People like Charles however have been learning how to manage woodland, via coppicing, pollarding and careful species selection. 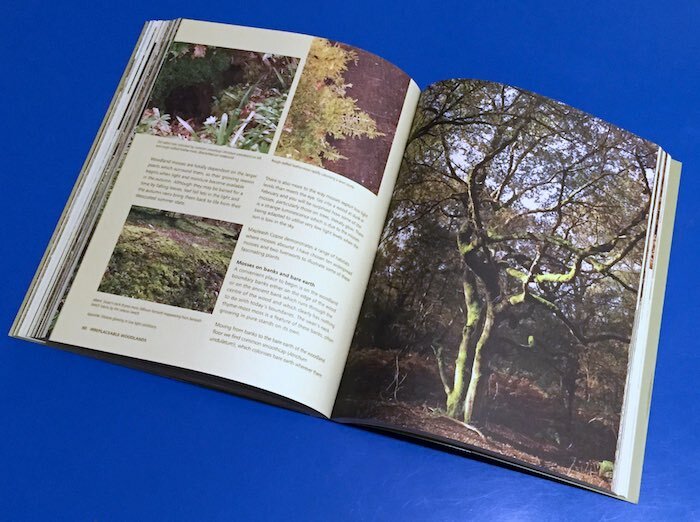 In this respect the book is a detailed practical guide to managing woodland, especially Hazel coppice, and the 30 years of hard-won experience documented here is gold dust for anyone in a similar position of responsibility. Or simply for anyone that finds it fascinating learning about the surprising intricacies of the woods they walk through. The level of amazing detail extends into the later chapters on the flora and fauna, including super-close up views of lichens, mosses and slime-moulds, alongside woodpeckers, moths and dormice. The photography throughout is top-notch and the publisher has done it justice with loads of full page images, luxuriously printed. All in all this book is a treasure that has taught me a huge amount and that I will be passing on (or recommending) to several other people that I know. Irreplaceable Woodlands is available on Amazon for £17. Price correct at time of publication. Disclosure: I was sent a copy of this book for review purposes. My review is entirely objective however. This post contains affiliate links. I was sent this book to review and was very glad to do so, as it promised to neatly solve a common class of problem. Often I'll be walking in the countryside and see a field of some unusual crop. Is it peas, or beans of some sort? Is it grown for animal feed or human plates? This slim volume promises to be your guide to all such countryside conundrums, crops being just one small part. It covers a wide array of topics, all well presented with good photographs and brief descriptions containing interesting tidbits, which makes it lively, engaging and informative. It's quite good to just sit and read in the comfort of your home frankly. With 96 narrow-format pages it really is quite slim, which is great for tucking into an already over-burdened bag, but I felt that its compactness is also its biggest problem. There is just one page on crops (so no help at all really for my problem above) and if you want to look up badgers, bats, kingfishers, or any owl other than the little owl, you're out of luck. It's ironic that there's a picture of a barn owl on the back cover, but nothing about them within. I presume that the authors were forced by size-constraints to concentrate on common daytime species, but when we saw what might have been a badger's sett and I opened the book with my young daughter, we were disappointed to find nothing. Similarly as we watched a bat skimming over a canal in the afternoon, or a kingfisher dipping into the river – surely one of the most iconic and treasured birds to spot on a walk? I think I (or perhaps it) got a bit unlucky with the things I saw on my walks, and realistically it's pretty good for identifying common plants and animals and learning more about the terrain itself. Its breadth is admirable, covering ancient monuments, waterways, boundaries, clouds, village life and more. It's already a decent book for the keen novice that wants to get out and about, but will hopefully be much improved if a second edition comes along with 50-100% more content for the areas that are weak. Maybe based on feedback they could find some relatively unpopular sections to cut entirely, to enable the rest to really shine without becoming a weighty tome. Happy new year from UKNB! I'm personally looking forward to spring arriving and the burst of greenery and life that brings, but in the meantime I got a great Christmas present in the form of the RSPB's "Wildlife of Britain" book, quite accurately subtitled "The Definitive Visual Guide". Published by Dorling Kindersley, this is a weighty hardback tome of over 500 pages. Most of those pages are smothered with photographs of wildlife, and that's what really stands out about this book. The sheer number and quality of photographs makes it indispensable as an identification guide or for joyous browsing. As well as the endless pages on individual species (covering mammals, birds, reptiles, amphibians, fish, invertebrates, plants, trees and fungi) there are sections on six major habitat types of the UK, though I wasn't so fussed about those bits. It doesn't cover every last exotic species to be found, and the amount of text for each individual species is relatively limited, but if I was allowed just one UK wildlife identification book then this might well be it for the sheer coverage and all-round quality. If you live in a town or city and want to find out a bit more about the wildlife that shares that area with you then request a copy of the free RSPB's Wildlife on your Doorstep booklet via their website. This wonderful booklet covers birds, plants and animals that you should be able to find as you go about your day to day life. It contains loads of great photographs as well as many colour illustrations showing you where to look to find what may not be immediately obvious. There are specific features on street and waterfront wildlife as well as hints and tips as to what you may find on a trip to your local park. Overall it's great to see something concentrating on urban wildlife rather than making some city dwellers think that nature can only be found if you head to the countryside. Certainly our experience of what you can see in an urban back garden shows that there's plenty there if you look properly.